THOMSON Complete Guide to the TOEIC Get Best TOEIC Preparation Materials and Practice Book for Reading, Writing, Listening, and Speaking. 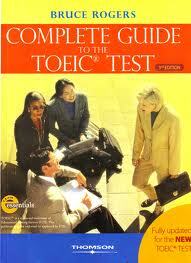 Get TOEIC Materials , Tips, Tricks. Practice more and boost your score. This program is designed to provide students with the strategies and practice required to improve their scores on the Test of English for International Communication (TOEIC). It is up-to-date for all recent changes made to the TOEIC exams. The Complete Guide to the TOEIC Test provides learners with a clearly organized, step-by-step program for maximizing test scores. It is the most complete and up-to-date guide to the TOIEC Test on the market.